The missile base is the birthplace of US rocket programs and the national monument is totally surrounded by the missile range. Access to the monument is closed for a few hours during each of the 800+ missile tests conducted each year. The infamous Trinity Atomic Bomb Site is located 70 miles north of the monument and is only open to the public twice per year. 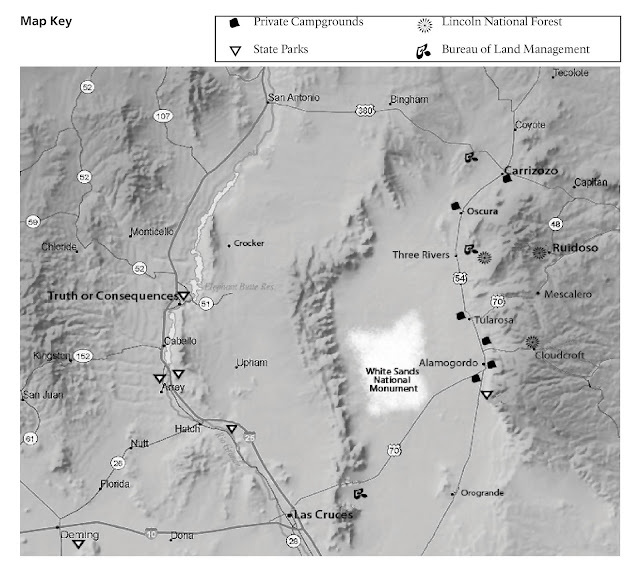 How fitting is it that the Trinity Site is located in a place the Spanish settlers originally named Jornada del Muerto — the Journey of the Dead? 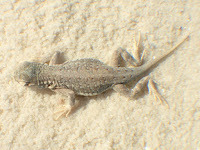 First hand observers descriptions of this explosion and its impacts (pun intended) on the local environment are recorded here..
White Sands National Monument is perhaps more famous for its 275 sq, miles of tall gypsum sand dunes. It has been a destination for tourists since it was established in 1933. That was well before creation of the rocket and atomic bomb programs associated with the region. The nearest town is Alamogordo, NM which is where I stayed for a couple of weeks between Habitat For Humanity Builds. 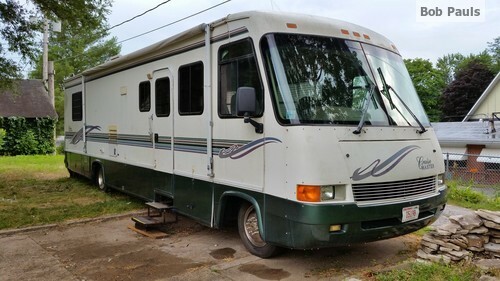 Nearby attractions include the New Mexico Museum of Space History and the Lincoln National Forest. 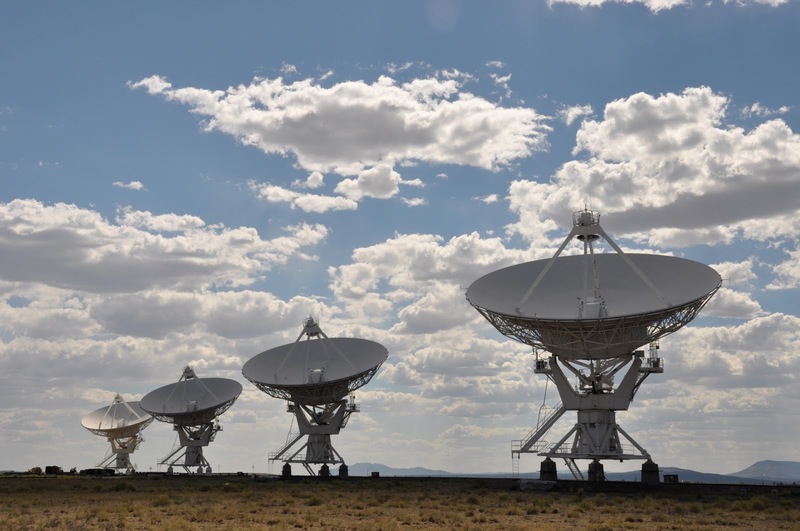 Nearer to Albuquerque is the Very Large Array (VLA) astronomical radio observatory that is famous for its 27, 82 ft. wide receiver dishes. The biggest employer is Holloman Air Force Base which is home to the F-16 fighter jet. 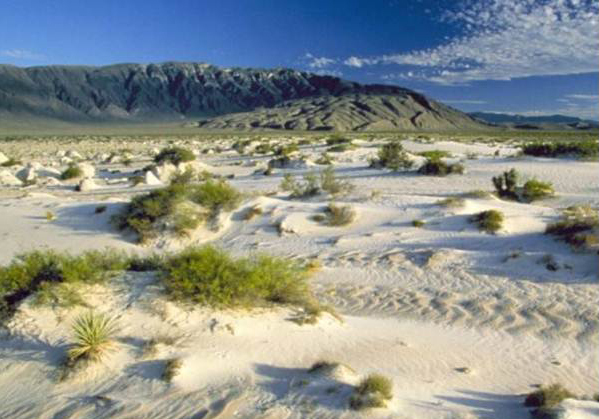 I was fascinated to learn that White Sands has a sister national park in Mexico, Cuatro Ciénegas. 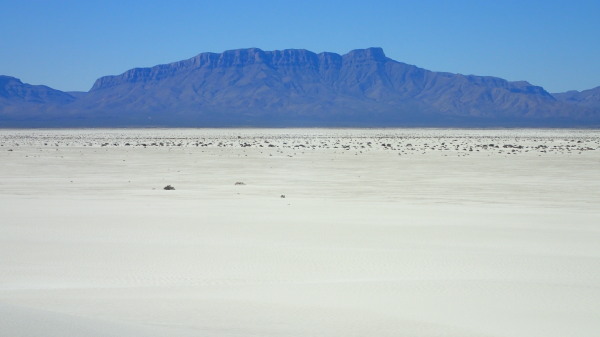 Both are located in the Chihuahuan Desert, and don't just blow away as one might expect because they are nearly 100% humid beneath the surface. This moisture along with plant life bonds the small gypsum crystals creating resistance to wind erosion. Most of the dunes I walked on were quite stable except for the leeward side of steep dunes. 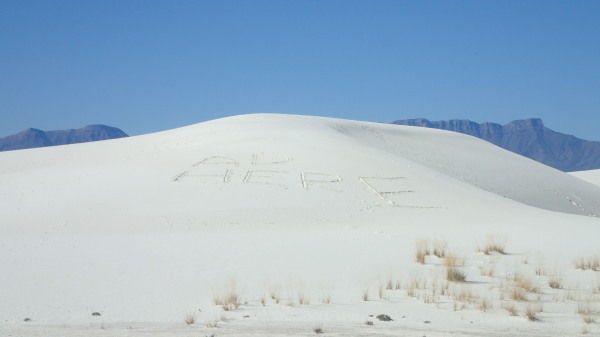 So stable were dunes that visitors etched albeit temporary signs on to their sides. The monument is literally blinding beautiful and blisteringly dangerous. Hiking options are strenuous and have been known to kill underprepared hikers. 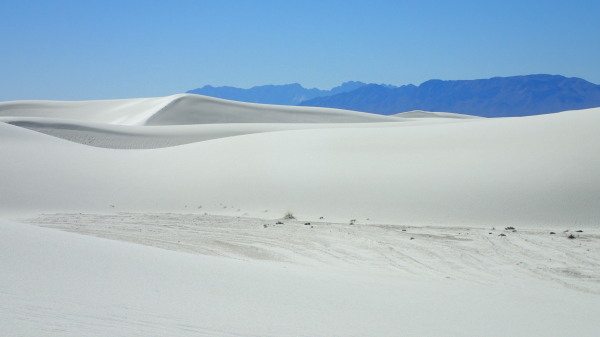 Yet, the dunes serve as a playhouse for hikers, geologists, sand surfers, balloonists, desert explorers and photographers. Amazingly resilient species survive the extreme environment of the constantly shifting dunes. Plants, animals (especially lizards) and even fish are able to adapt to wild swings of temperature, moisture and salinity. The plants help shape the windblown dunes. 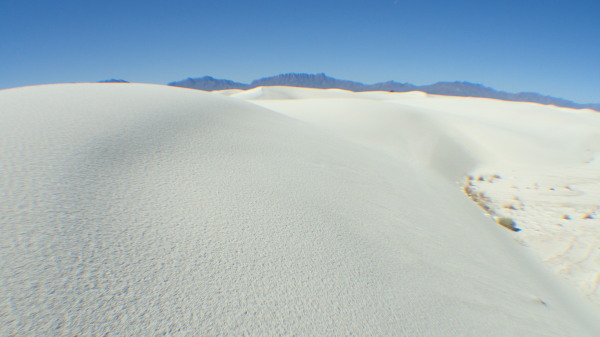 This most excellent, hour-long video, White Sands, White Wilderness: A Visual Exploration of the World's Largest Gypsum Dunes, superbly documents some of the wonders of the dunes. 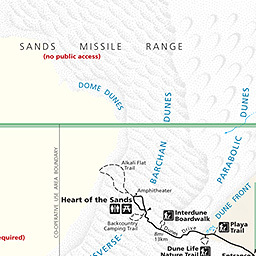 This aerial map demonstrates how the water and wind-based erosion from the San Andreas Mountains to the west has contributed to the creation of sand within the monument. As long as one can tolerate the swings in temperature, visitors could take a couple days to fully explore the wonders of this national treasure. 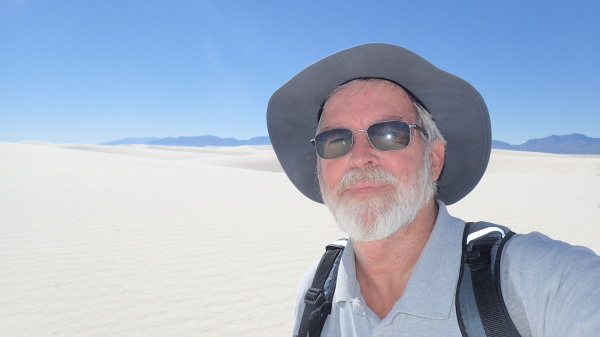 I took the five mile morning hike out to Alkali Flats to take the photos shown in this blog. The loop trail is well marked so you can venture off trail without getting lost if you stay within the loop. Doing so you'll be able to see the infinite variety of dune formations from different perspectives. If your goal is to go sledding in the desert you can rent or buy ($$) plastic sleds in the gift shop. BTW, you will get sand in your shoes and every other piece of clothing and equipment you have with you, especially if the wind is blowing. Take plenty of water and apply sunscreen. You can get a great tan or sunburn depending upon your preparedness.